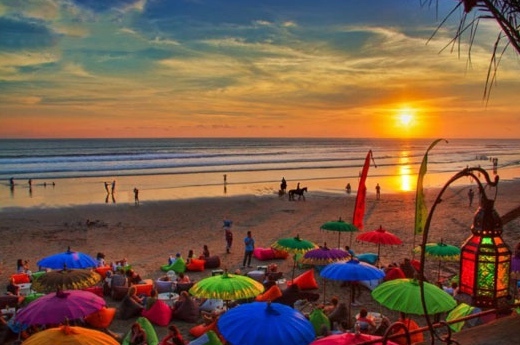 The place to be at sunset in Bali is without a doubt Legian Beach. Come down at witness not only the crowds of people but also the absolutely gorgeous sunsets. If you happen to be staying in a Villas in Legian and are close to the Double Six area or if you are in a Seminyak Villa you should really make the effort to come down and be among all the action and excitement that Legian is famous for. There are dozens of really cool beach bars, most notably La Plancha where you can sit on a bean bag have a few cold beers or some cocktails and enjoy the atmosphere. It gets packed during the times of 4pm – 6pm so you have to get down there early so you can get the best front row position. Weekends are absolute madness with local families and people from the main island of Java coming over to have some fun in Bali. It’s not only ex pats or Aussies that come here but there is a massive Indonesian middle class that is starting to explore the delights of Legian. Most of the Bali beach villas we rent are within a 1 to 2km radius so getting to Legian is a matter of hopping into a taxi and you will be there in no time. If you have rented a scooter, even better. You can avoid the traffic jams along Jalan Legian, weave through the traffic jams and pull up right on the beach where there is parking. Our tip, once your here is to you is walk up and down the Legian Beach area and choose a beach cafe that’s not too crowded or busy where you and your friends can enjoy the vibe. It tends to get very noisy at the more popular beach bars but if your into that then go for it. The quieter bars tend to be at the fringe of the main beach area. From the video above you can really get a much better idea of just how busy the main beach area can become. But just remember there are many options available to you. Most of the bars serve delicious Indonesian, Western and local Balinese dishes and there are also hamburgers, pizzas and small finger food for the kids. For those that like to party a bit and enjoy louder music the bean bag beach bars are definitely the go. Here they have live music that can be pretty loud so be warned. Just off the beach area the famous Double Six intersection also has a host of places to eat and can technically be termed Legian Beach. For the young try Cocoon (which is famous all over Bali as a day club by the beach which has a pool and serves the most amazing cocktails) and for the families you may like to head south along the road where you will find many restaurants that have sensational beach views and where you can sit in the comfort of a chair and be served by a waiter. Far more civilised for some people. As you wait for the sun to set don’t be surprised if the local vendors make their way over to you trying to sell you everything from fake Gucci hand bags, Genuine Rolex watches for less than $10, sarongs, t shirts, tattoos, wood carvings and in some cases and you really have to be careful about this drugs ( stay well clear from this and simply walk away). As the sun slowly dips over the horizon the mood changes and amps up a notch as people work out exactly where they are going to do and what they are going to have for dinner. Most tend to hang local and eat and drink nearby in Legian where there are many options for every taste and budget. The whole atmosphere at Legian Beach has to be seen to be believed. Make sure you do come down here for at least one sunset. You really won’t be disappointed.